There's been a lot of activity in the Children's Literature Prize area lately. With dates looming closer, the shortlists have been announced. 1) Ghost Hunter by Michelle Paver. This is the sixth and final book in the amazing Chronicles of Ancient Darkness series. Beginning with Wolf Brother, this series follows the life of Torak, orphaned and ostracised from his clan in a land 6000 years ago. It has been consistently brilliant throughout, and the last book was gripping and enthralling. 2) Unhooking The Moon by Gregory Hughes is an extraordinary story tracing the journey of two orphans, 10 year old 'Rat' and her brother, Bob, as they hitch a lift from Winnipeg, Ontario to New York in search of their uncle, knowing only his name and that he is a 'drug-dealer'. 3)Now by Morris Gleitzman is the third book in his series centred around the Holocaust and conclues the story of childhood friends, Felix and Zelda. Felix is now a very old man and his granddaughter, Zelda (named for his old and treasured friend) shows unique bravery and stamina in standing up to school bullying and dealing with terrifying forest fires. 4) The Ogre of Oglefort by Eva Ibbotson offers some relief ffrom the highly serious subject matters of the others, while maintaining the highest standards of writing and story-telling. Four unusual companions set out to rescue a princess from an ogre, who is not at all what he seems. But then, the princess is something of a surprise, as well. And one final mention for the Roald Dahl Funny Prize. There are two shortlists involved here, so for the sake of blog space, I'll just give you a few of my favourites and the link to the site. 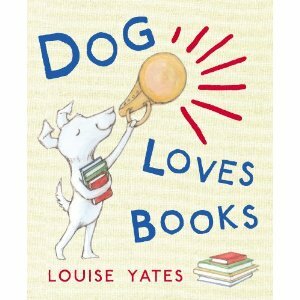 For the Funniest Book for ages 6 and under: I really love the wonderful picture book Dog Loves Books by Louise Yates. 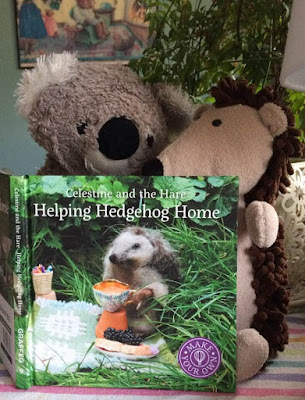 (My review for this one is one my Picturebooks page.) Also, One Smart Fish by the magnificent author/illustrator Chris Wormell. Today, the children of Galway (both in body and spirit) turned out in incredible force at Dubray Books on Shop Street in Galway to meet Derek Landy. They were trying to queue from about 12.00, but I had to send them away, promising them front positions. In retrospect, I should have gotten out the 'coat room' numbers, perhaps. In the end, inspite of there being over 200 people moving through the shop...and inspite of the extremely changeable weather, it all went off without a hitch. Derek arrived in good time and got straight to it! Throughout the entire event (we were there until 7.30pm...3 1/2 hours! ), he was lively, engaging, gracious, smiling, funny...truly amazing as he took time with each and every child (and their parents). And even those who stood in that queue for over 3 hours...tired and cranky, though they may have been prior to reaching him....all of them left saying it was well worth the wait, with smiles on their faces, clutching their newly signed books. It was great! And Derek Landy is truly stellar!!!! Many thanks to Derek... let's do it again sometime! 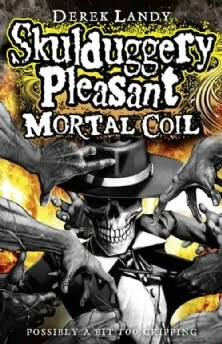 1) Don't forget.... tomorrow, Tuesday, 14th September at 4pm, DEREK LANDY will be at Dubray Books, Galway to sign his new book (and the fifth in the series) 'Skulduggery Pleasant : Mortal Coil'!!!! This is Derek's first appearance in the West of Ireland since winning the Bord Gais Irish Book of the Decade earlier this year. The award was voted by you, his wonderful readers, for the first in the series, simply titled 'Skulduggery Pleasant'. And I'm sure Derek won't mind signing the earlier books, as well. It's looking like there will be a crowd...lots and lots of interest.... but don't worry, there will be the wonderful staff of Dubray Books (that means myself and my co-workers) to entertain you. And we can be pretty entertaining. See you all there! 2) Also, and very exciting indeed, Deirdre Sullivan will be at the Galway City Library on Augustine Street at 6pm on Wednesday, 15th September to launch her new (and first) novel for teens, 'Prim Improper' published by Little Island. Excellent news from Deirdre Sullivan (and Little Island Press, those wonderful and talented people! ): Deirdre will be at the Galway City Library this Wednesday evening, 15th September at 6pm to officially launch her new (and first) novel for teens, 'Prim Improper'. This wonderful book tells the story of Primrose Leary. Prim has just started secondary school, has a burgeoning interest in boys, and has to deal with an extremely embarassing father she barely knows along with the fact that her mother isn't around anymore. Told with compassion and real humour, 'Prim Improper' demonstrates a great understanding of character and storyline. Deirdre is a local Galway girl who graduated from NUI Galway with a masters degree in drama and theatre and is now teaching in Dublin... and, I'm assured, is finishing her second book as we speak. Busy woman! All are welcome to attend the launch, so I hope to see you there. The votes have all been counted and it's all over but the shouting. 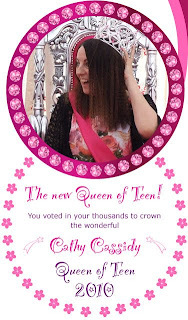 The 2010 Queen of Teen, as voted by you, the readers is......... Cathy Cassidy! Author of many wonderful books, such as Indigo Blue, GingerSnaps, Angel Cake, the Daisy Star books (for younger readers) and the newly published Cherry Crush (first of the Chocolate Box Girls), Cathy is one of the hardest working and most giving of her time. 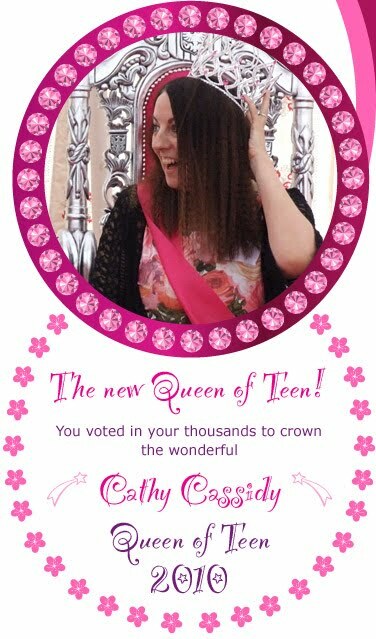 Congratulations, Cathy Cassidy!!!! It's time, once again, for the MS ReadaThon! Kicking off on the 15th of October, you have a whole month of reading your favourite books to support this very worthy cause (and be in with a chance to win some fantastic prizes.) If, for some reason your school doesn't participate, don't forget that you can sign up as an individual. And... for all you adults, this year MS ReadaThon have created a campaign for grown-ups to talk about all their wonderful memories of great childhood reads and discuss their current reading. Great idea for bookclubs! Competitions, quizzes, polls, etc. are available on-line for children and grown-ups. So... pop into your local library or bookshop to pick up all the information you'll need; or check out the newly refurbished website from the link below. Get ready to read for a great cause! There's also a facebook page to follow all the bookish action and excitement. And, if anyone of you would like to join me, on my blog as I organise a blog-reading-event, just contact me and let me know. Look forward to hearing from you! Queen of Teen Last Chance! This is your very last chance to vote online for the 'Queen of Teen'. The voting closes on 9th September (that's tomorrow) and the 'Queen of Teen 2010' will be crowned on Friday, September 10th. If you haven't already done so, just click on to the link below and follow the instructions. It is the teen-fiction-loving readers who choose their Queen, so your vote absolutely counts! Last chance!!!! As school is well and truly underway, and winter (ugh) approaches, I wanted to republish this essay from my dear friend Kevin Whelan as a reminder to us all. Reading should always be a pleasure and one that we pass on to the children with joy... but, as we all know, sometimes it's just not that easy. In the effort that is made to get them through the curriculum boxes, sometimes the joy of reading for pleasure gets lost. It's too important. Don't let it. It is with great excitement that I take this moment to confirm that, yes, indeed...on Tuesday, 14th September at 4pm, Derek Landy will be at Dubray Books, Galway to celebrate his latest book and the fifth in the series, Skulduggery Pleasant : Mortal Coil, and to sign copies of this and all of his Skulduggery books. 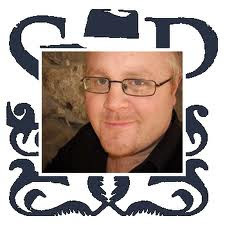 As we all know, Skulduggery Pleasant was the winner of the Bord Gais Irish Book of the Decade accolade, giving great validation to children's literature and it's young readers. This is Derek's first visit to the West of Ireland since winning this award. 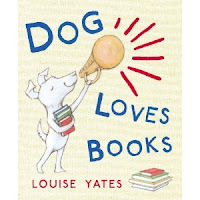 And at Dubray Books, we are completely over the moon to have him visit. It's the first of September, and that means the Autumn 2010 issue of Inis Magazine (published quarterly by the good people of Children's Books Ireland) is in the shops! I happen to think this is one of the best yet. The cover art is by the wonderful Kevin Waldron. 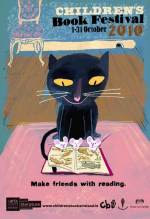 (You will also find this on this year's poster and brochure for the Children's Book Festival 2010.) Inside, the first article you are greeted with is Siobhan Parkinson's keynote address from the CBI conference in May. This address "Chasing White Rabbits: Literature as a Collaborative Artform" is something that should be read over and over again by anyone involved with children's literature, so that we don't forget why we do what we do and how important children's literature is to our children, and to ourselves. You'll also find a conversation with Anthony Browne and an amzing article on the picturebook illustrations of Elena Ordiozola by Valerie Coghlan, who has an amazing grasp on illustration and visual literacy ... and much, much more. I take absolute delight in each and every issue of Inis, and am also proud to contribute (reviews) in my own small way. Thanks to Mags, Tom, David, Patricia, Jenny...everyone at CBI. And absolutely stunning crew!! !